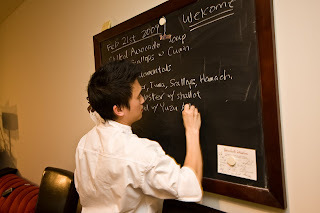 I love this chalkboard and how we use it to write out the menu. It's actually my brother, Ambert's. I wasn't really turned onto the idea of having a chalkboard up, but I really like the feel of it now that we do it consistently for each party. It has nothing to do with food, but everything to do with the experience. The food is important, and I'm not going to marginalize it's impact on the experience. However, service and experience is the priority in my kitchen. I want to always be closing the gap between the cook and the customer.